Cheapie Theatre: Engine Heart: The Kickstarter Material. 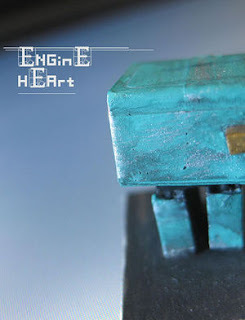 Engine Heart: The Kickstarter Material. As it may be easy to tell by this point I really like the Engine Heart setting. For those just tuning in Engine heart is basically Human Drama but without the humans. Think Wall-E, Brave little Toaster, There Will Come Soft Rains, and the like. Domestic 'bots trying to survive when human infrastructure is all crumbled. The Kickstarter has Ended, and since Viral's almost doubled the original goal of $7500 he'd had a few gifts for the world at large. Of course while this post focuses on the minimod booklettes they're not much good without the core rules. The PDF's in general are very minimalistic. Not a lot of fancy tables other than the occasional charsheet. All the text is fully selectable and while each is very small, only twenty or so pages at most, each covers enough ground to give imaginative Programmers (GMs) plenty to work with, especially if they try interconnecting several, or mix and matching elements. So, why is this good? Why spend your time on what is something somebody on the internet made and somebody else on the internet is saying to pick up and play especially if you've gotten sick of just how long it takes to set up, the arguing over skills and ending maybe an hour long session five hours after your group got together? The fact it's a bunch of PDF's instead of a gigantic 'holy crap this thing's got SO MANY PAGES' is actually a bonus here. Instead of having to hunt and hope you can go straight to the one you want and away you go. Doing chargen? Boom. Core rules. Trying to figure out what the factory has? Lights and Power. Space oriented? Worlds above. Plus there's a 'master' PDF listing all of the features/flaws in one easy to find location. Plus there's the setting itself. Urban and or Future has been done. Fantasy has been done to death and beyond. This? Playing as little robots (or some not-so-little as the case may be) trying to just get by in a world falling apart while going through with whatever your core programming/fixation is diffrent but not so much so that people can't wrap their heads around it. I mean one podcast had a party saved from a total wipeout when one of them, while in the process of being reprogrammed managed to punch back and repurpose the factory that had caught them. Neat huh? Here's what makes it cooler. That character was little more than a CPU stuck in a workbench. That isn't snatching victory from the jaws of defeat. That's reaching in and snatching victory out of defeat's stomach a few hours after it'd eaten. Update: If each one of these in a separate booklette isn't appealing there is an all in one bundle PDF. Thanks Viral! Industry Standard: Picture if you will a City with no suburbs. No 'infill' between it and the next town over. Just flat expanses of road, wilderness, and then suddenly a wall of skyscrapers ending either in huge machines building ever higher, machines tearing them down for raw materials, or jagged points where neglect and time have taken there toll on the ever-changing skyline. The Buildings here are empty shells with never a thought for Power, or Doors or even places to stand at some points. After all the Big Builders only care about building the shells, not what goes in them. Nobody ever told them to stop building either so that is what they do day in and out. Yet even in a city of empty shells there are bots that eek out a living. Businesses that move at the drop of a hat, bookies that play the odds on when the construction crews will come through next. Just watch out and make sure you don't get embedded in the latest round of building! In Transit: Special thanks to Robert Taylor, creator of the Rivets microgame for the use of the 'Locust' design. Even when humanity is gone there's still the problem of what happens when their war machines never quite got the memo about the war being over. The central setpiece is a small town about to be descended on by two small armies of 'locusts'. Autonomous war-machines that will strip a given area bare of resources to build more of themselves. There are only their Masters and Enemies. The Masters are long gone but that does not matter. There will always be Enemies. Oh and where most player and non-player bots are capped at 100 points. These things are built using 150 points. This is going to be fun. The good news is you, the player group, won't have to fight (or hide) alone. There's other robots in town that can be convinced to help. You've got a gas jockey that runs an autowash that 'washes' it's clients in high pressure sand while it locks them inside, a butler that is standoffish and rude but will fight to the bitter end to protect his master's home, a robot commune in the town's car dealership, and a bot that's survived in the apartment complexes by hiding in with the broken and deactivated waiting to pounce and drain away the life electricity of the unwary. The World Above: Years ago, when is unimportant, a group of forty little bots were prepped to launch into space. One of these was injured in the pre-flight sequence and was grounded so the others could launch on time. Since then it's had to endure being in an environment it was never built for and the facility it was housed in being destroyed by a hurricane. Another rocket exists, has been located, and this wayward little bot will not leave it. It's dream. It's Directive is to fly, join the Lunar Platform it's siblings have been building ever larger in hopes of attracting human habitation. This minimod doesn't go into great detail of what is out there, as that is dependent on what the programmer's wanted for the universe (I'm working on a Mars setting for example.) What's Important is this helps fill the gaps on what sort of things might be needed/useful for bots that aren't designed for this world. Consumer Grade: Written by Kalad “CaesarSalad” Hovatter this little adventure focuses on a mall in Anywhere USA (or Europe or Wherever) that's trying to get by After People. The Food Court's Smashed, The tram is almost suicidally depressed because the rails are broken, the maintenance system is down, and the Security System is plotting to kill everyone. But Everything Must Go! Never-mind the fact the parking garage is about to cave in on itself because the automated meter maids have towed everything in a five mile radius and piled them high they will cheerfully service any vehicle you've ridden in on just to alleviate the boredom. You will be greeted by a frostee machine that'll explain the rules of trade, possibly direct you inside, all in the hope you can help him get a few ingredients he needs to start making sno cones again. Inside it's a free for all. Sure People have been long gone, but that doesn't mean Trade doesn't happen. Leave your money at the door they don't take that here, except when they do because it's made of useful metal. It's a free-for-all barter town here and if the store you're at doesn't have what you want they know where to get it even if that means beating up the bot next door and taking his things. Nevermind the fact the mall's atomic generator hasn't been serviced in awhile and might go critical at any time or that security might finally snap and start reprogramming you to try bringing everything back in line with what it thinks things should be like. We have the Deal of a Lifetime waiting for YOU! This Booklette also has, in addition to the usual Features/Defects, a random location generator. Not only does it cover locations but also robot density and how the locals behave be it a small group of individuals hat go about ignoring eachother, a commune that works for shared survival, a whole horde of bots establishing a pecking order based on who can browbeat and bully who, or even a city trying to rebuild itself. Very handy for the Programmer that wants locations between the set pieces you've got or if you need details but need an extra nudge. Stickers! : OK the link goes to a PDF instead of actual stickers, but it's a printable set of 64 icons that all look pretty spiffy. Far more impressive if you pitched in for a physical copy since you got that, except each one peels off and you can stick 'em to something. Viral has gone above and beyond. Not only did he come up, with help from Forums that Should Not Be Named both for playtesting and input. People cannot write well when they're alone. Oh sure we're often told 'don't write for other people write what you want to write.' Trouble there is when you get no feedback it gets discouraging and you tend to lose that push to keep moving. The feel I've gotten is Viral's done this less to get rich and more because he really wanted to see his work on store shelves. I mean I want him to make dumptruck loads of money. Money enough to keep doing this sort of thing. Sure all of the above are labeled as kickstarter-only rewards, but at the end of each is a note from Viral to share with friends. Keep in mind he hasn't done this for the sake of profit above everything else. He wanted to make something he liked and would catch the attention of other people. It's only now that he's hoping to make a little money. So while a lot of the people who have helped viral haven't gone named. I'm going to thank all of you, whoever you are, for helping this guy get something this amusingly weird created, tested, and out the door.